An Ebola outbreak in the Democratic Republic of Congo is threatening to spiral out of control as overstretched health workers contend with armed rebels and a distrustful local population. Authorities have recorded 200 total cases and 125 deaths since the outbreak began Aug. 1 in the northeastern part of the country, according to World Health Organization figures released Friday. Relief efforts have been hindered by ongoing conflict in the DRC’s North Kivu province, where at least 100 armed groups are fighting against the Congolese army. The violence has prevented health workers from identifying and monitoring people who have come in contact with Ebola victims and may be spreading the virus, particularly in the city of Beni near the Ugandan border. “Insecurity that has increased in the city is one of the reasons why we are seeing these new cases coming up,” WHO spokesman Tarik Jasarevic told reporters in Geneva, according to France24 News. 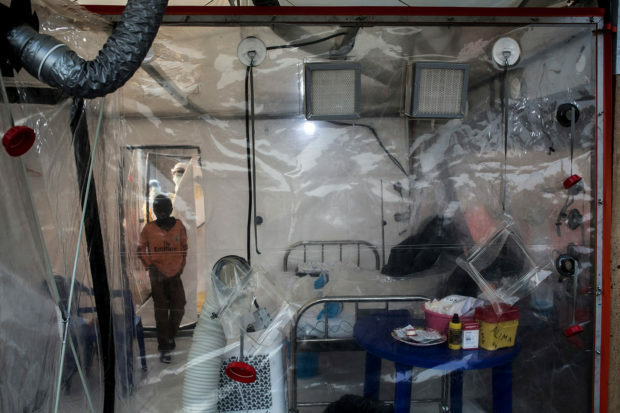 The number of new Ebola cases per day in the DRC has doubled since September, according to the International Rescue Committee, a disaster relief nonprofit. The outbreak is now the worst since a 2016 Ebola epidemic killed more than 10,000 people in West Africa, mainly Sierra Leone, Liberia and Guinea. As in previous Ebola epidemics, many local residents have reacted to the presence of international aid workers with fear and conspiracy theories about their intentions. Earlier in October, three volunteers on a Red Cross “safe and dignified” burial team were attacked by an angry mob while trying to dispose of a still-contagious body. Civil war and hostility from the local populace could prolong the Ebola outbreak, Red Cross officials say. “We are concerned that (violence) is contributing to the rise in Ebola cases in Beni and that this could be the tipping point for an accelerated spread of the disease,” Red Cross spokesman Euloge Ishimwe said, according to Reuters. Health officials working on the ground expect the outbreak to last for several months, but warn it could stretch even longer if regional insecurity persists.